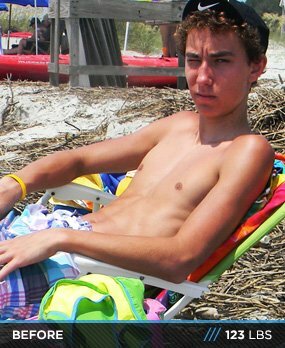 This teen when ape on the weight and gained 40 pounds of rock hard mass in one year. See what Reed did to stay the course and show his heckling classmates who was boss! Running 70 miles a week to stay competitive at the state level in cross country and track left my body visibly stripped and weak. Having strong cardiovascular health wasn't enough for me. After running personal best times in the 1600-meter race, I decided it was time for change. I was strength training once or twice a week while running and could barely bench the bar in 2011. I saw small results by adding five-pound weights to each side. I was determined to maximize those results and see how far I could go. It has hard because friends would put me down by saying I didn't have the right body for lifting. A cheeseburger without the meat was my meal of choice and I was humiliated and teased for it. I had to show them what I was made of. I was like, "Hey, I competed at a high level in one sport. What's stopping me from doing it in this one?" I strapped down on a strict high-calorie diet that led the way for change. Advancing my diet from cheeseburgers without meat was a starting point. Proper supplementation turned out to be mandatory. I quickly realized that taste must be sacrificed for looks. You are what you eat. If you eat crap, expect to look like crap. I saw satisfying results fast. Lifting 5-7 days a week did the trick. Heavy weight and low reps was key for me. I always pushed to failure and never took a day off from my workout plan. Mixing things up was very important because my body was always guessing. It took faith, hard work, and time. There's no shortcut to a better body. Lifting taught me dedication. I believe that proper supplementation was crucial. Preparation upon consumption was a lot of work, but the results rolled in and I buckled down. The supplementation was the most challenging aspect. The cost made me want to savor every scoop. I want to further my gains to see how far I can go. The sky is the limit and this is just a checkpoint for me. My advice is to really experiment with supplements, nutrition, and training regimens to see how your body reacts. Don't just throw any random supplement into your body. Do the research before you try anything crazy. Bodybuilding.com played a crucial role in my journey. It provides supplements at the lowest price you can find. I wouldn't have been able to afford the continuous supplementation had I been forced to purchase locally.